Rich and chocolatey and warm and spicy, with plenty of soft icing, these are a delicious tea time treat. 2. Put all the ingredients in a large bowl and whisk until you have a smooth batter. 3. Divide between the paper cases in the muffin trays, I use a 50ml ice cream scoop. 4. 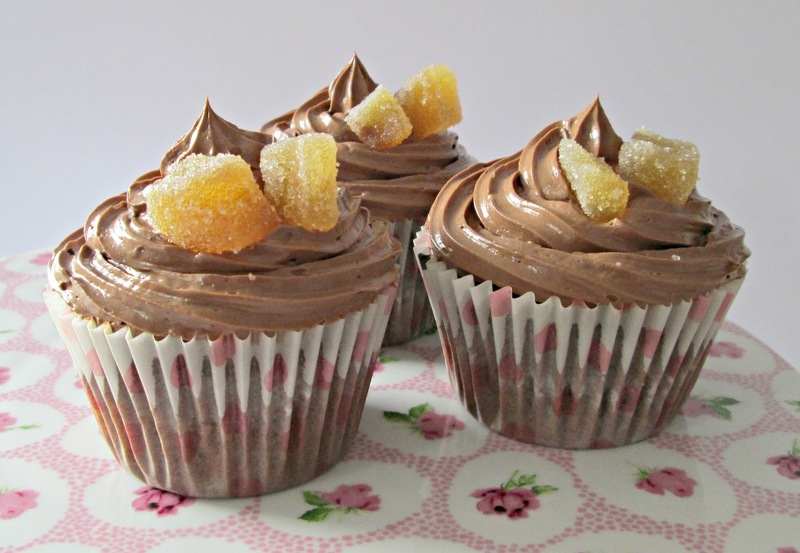 Bake for 20-25 mins, until the cupcakes are springy to the touch. 5. Remove to a wire rack and leave to cool. 1. Put the sugar and water in a small pan and heat slowly until the sugar dissolves. 2. Bring to the boil and boil until it reaches 110C on a sugar thermometer. Don't let the syrup start to caramelize. 3. Meanwhile, put the egg yolks into a bowl and briefly whisk, then pour the hot syrup into the bowl in a thin, steady stream, whisking continuously. Keep whisking until the mixture becomes pale, mousse like and completely cold. 4. Gradually whisk in the butter, followed by the melted chocolate. Pipe or swirl the icing onto the cupcakes and decorate with crystallized ginger. Coffee and chocolate sponges, marbled together and studded with chocolate chips, then glazed with a white chocolate ganache, perfect with a cuppa, and so easy to make. 2. Put butter in large bowl and beat until creamy. Gradually beat in sugar, then vanilla, and continue to beat until mix is very pale and fluffy. 3. Gradually add the eggs, a tablespoon at a time, if the mix looks like it's about to curdle, add a tablespoon or two of the flour. 4. Sift the flour and salt into the bowl and gently fold in. 5. Divide the mixture into two bowls and add the coffee liquid to one, mixing well, and sifting the cocoa and adding the milk and mixing well to the other. 6. Add alternate spoonfuls of each mixture to the lined tin, scattering in the chocolate chips as you work. 7. Bang the tin on the work to a couple of times to expel air, then, using a round bladed knife, swirl it through the mixture to marble it. 8. Bake for an 1- 1 1/4 hours until the cake is well risen and a skewer inserted in to the middle comes out clean. 9. Leave to cool in the tin for 20 mins, then remove to a wire tray and leave to cool completely before icing. 1. Place finely chopped chocolate and butter in a bowl. 2. Heat cream, almost to the boil, then pour over the chocolate and butter. Leave to stand for a few mins, then stir gently until smooth. Don't over mix or it my separate. 3. Leave to cool until it reaches a thick pouring consistency. Level the top of the cake if you wish using a sharp knife, pour over the glaze and dust with cocoa powder. Really easy to make and so good to eat! Delicious served with a generous dollop of Chantilly cream. 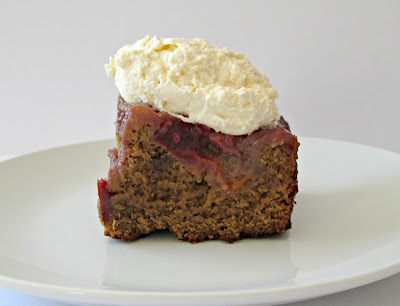 It's a BBC Good Food recipe again, here's the link. It's a kind of upside-down cake made with plums, and a melt and mix gingerbread sponge. 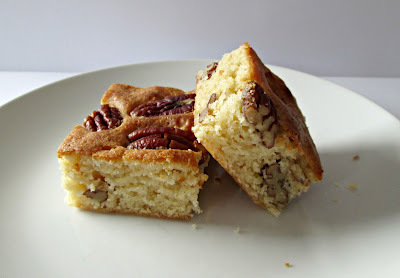 This cake is made with a slightly more time consuming method than the standard creaming method, the eggs are added very slowly and the flour is double sifted and folded in, but, it gives a fantastic light, well risen and even result, it's well worth a try, your friends and family will thank you for it. 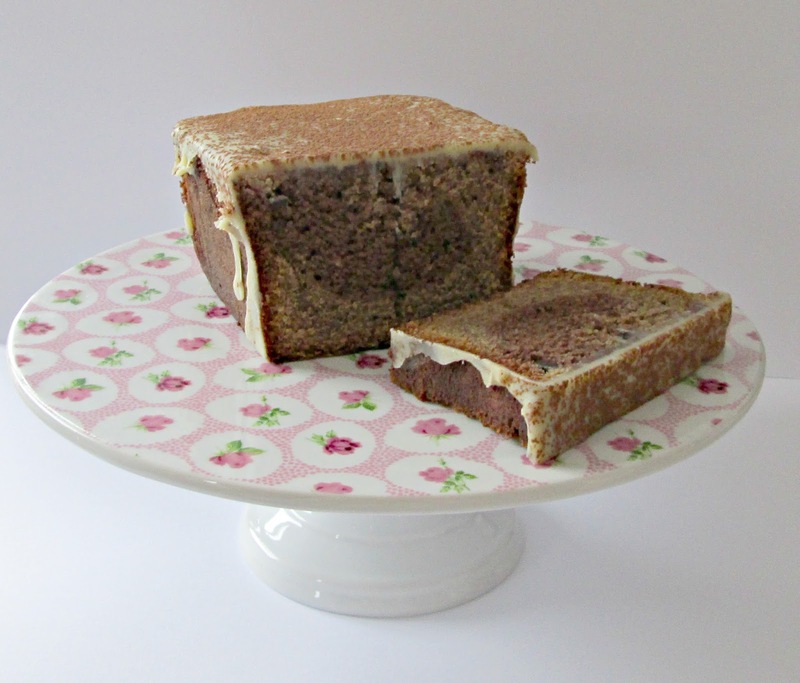 I've used special cake tins with raised inserts so that the cake can be deep filled, but this mix will work just as well in standard sandwich tins, you just won't be able to be quite a generous with the filling. 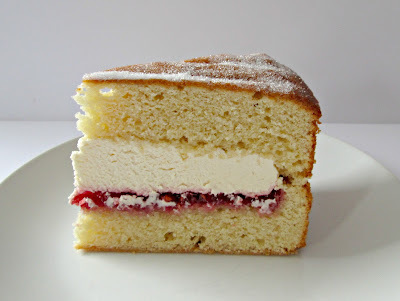 I know cream isn't traditional in a Victoria sponge, but who doesn't like a cream cake?! 2 x hidden centre sandwich tins, well greased with cake tin release (both products available from Lakeland) or 2 x 25.5cm sandwich tins, greased and base lined. 2. Put butter in a large bowl and beat until creamy. 3. Gradually beat in sugar, then keep beating until the mix turns almost white and becomes very fluffy, this will take 3-4 mins. 4. Break eggs into a small bowl and add vanilla. beat lightly with a fork. Add to the creamed mixture a tablespoon at a time, beating well after each addition. If the mixture looks like it's about to curdle, add a tablespoon of the sifted flour. This process will take about 5 mins, don't rush it as it will give your cake great texture. 5. Sift the flour again, this time into the mixture, and add the milk. Gently fold into the creamed mixture, taking care not to knock out the air you've beaten in. 6. Divide the batter between the two tins, spreading it evenly to the edges, and bake for 20-25 min, until golden brown and springy to the touch. 7. Leave in the tin for two mins then turn the cakes out onto a wire rack and leave to cool completely. 8. Once cold, fill with jam and cream, and dust the top with caster or icing sugar. These are like brownies, but made with white chocolate and lots of pecan nuts, use really good quality chocolate for the best flavour. They're really easy to make and will disappear fast! 2. Put chocolate and butter in a large bowl over a pan of hot water, off the heat, not letting the water touch the bottom of the pan. Stir frequently until melted. 3. Remove the bowl from the pan and stir in the sugar, don't worry if it looks curdled at this stage. 4. Leave to cool for 2 mins while you beat the eggs in a small bowl with the vanilla paste until frothy. 5. Add the eggs to the chocolate mixture and beat with a wooden spoon until you have a thick, glossy batter. 6. Sift in flour and baking powder and mix well. 7. Add 100g of the nuts and mix well. 8. Pour into the repaired tin and spread evenly. Scatter over the remaining nuts, and bake for 20-25 mins. until a skewer inserted into the cake halfway between the centre and the side of the tin comes out clean. The centre should still be slightly soft. 9. Set the tin on a wire rack and leave to cool in the tin. Once cold, turn out and cut into 16 pieces. Like Jaffa Cakes? You'll love this! Orange sponge, topped with a a layer of "smashing jaffa orangy bit! ", then smothered in chocolate ganache. I got this recipe in Good Food magazine. 1. Place orange juice and sugar into a small pan and heat gently until sugar has dissolved. 2. Meanwhile, soak gelatine leaves in cold water for a few mins until soft. 3. Remove gelatine from cold water, squeeze out excess water and stir into the warm juice. 4. Pour into the small lined cake tin and chill for at least four hours or overnight. 2. Tip all sponge ingredients into a large mixing bowl and beat with an electric whisk until smooth. 3. Spoon into the prepared tin and smooth the surface. 4. Bake for about 55 mins or until a skewer inserted into the centre comes out clean. 5. Cool in the tin for 15 mins, then remove and leave to cool on a wire rack completely. 1. Heat cream in a small pan. 2. Place chocolate in a bowl. 3. Pour the hot cream over the chocolate and stir until smooth. 4. Leave at room temp to cool and thicken to icing consistency. You can speed this up by putting it in the fridge if you wish, but keep an eye on it to make sure it doesn't go too hard. 1. Heat marmalade or jam in the microwave to make it a little runny, and paint it over the top of the cake. 2. Flip the jelly out of the tin and place it on top of the cake. 3. 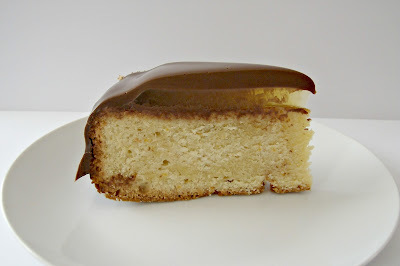 Top with the ganache, allowing it to fall down the sides. These are probably my favourite macaroon flavour combo, the bitter chocolate in the filling works so well with the spicy ginger and sweet almond meringue. These are guaranteed to disappear fast, one just isn't enough! 1. Put almonds, icing sugar and ground ginger into a food processor and process for 15 secs. 2. Sift mixture into a bowl. 3. Place egg whites in a large bowl and whisk until soft peak stage. 4. Gradually whisk in caster sugar to make a firm, glossy meringue. 5. Using a spatula, fold the almond mixture into the meringue a third at a time. 6. When all the dry ingredients are incorporated, continue to fold the mix until you have a shiny batter with a thick, ribbon like consistency. Too stiff and your shells will be hard to pipe and will have peaks, too soft and the piped rounds won't hold their shape. 7. Fill the piping bag with the batter and pipe 32 small rounds onto the prepared trays. 8. Lift the baking sheets and bash them on the work top a few times, fairly hard, to remove any air bubbles, this also helps form the frilly foot or "pied". 9. Leave a room temperature for half an hour. 11. Bake for 10-15 mins, until crisp and the base doesn't wobble when peeled gently from the paper. 12. Leave to cool for 10 mins, then remove from the paper and cool completely on a wire rack. 1. In a bain marie or in the microwave, melt the butter, ginger syrup and chocolate. 2. Remover from the heat and stir in the cream and stem ginger. 3. Cool for 20 mins, stirring occasionally. 4. 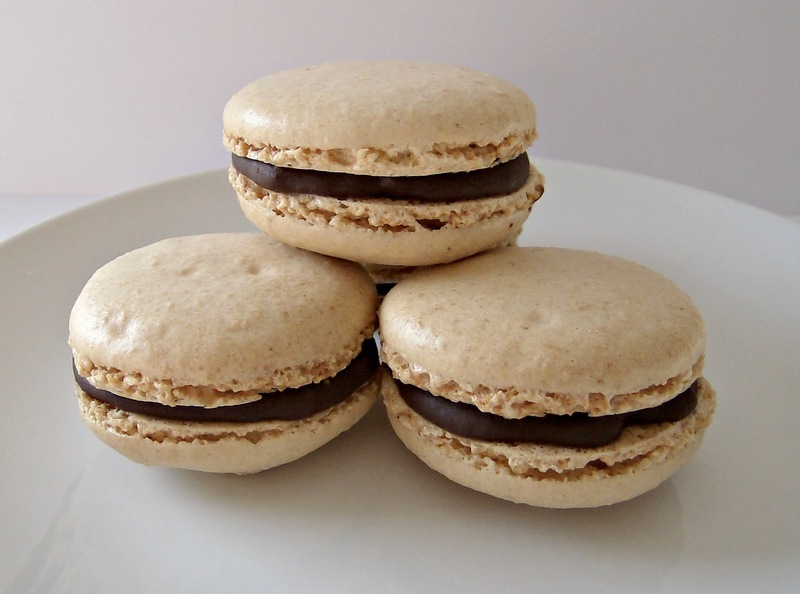 Use to sandwich pairs of macaroons together.